How to convert PDF to Excel ? 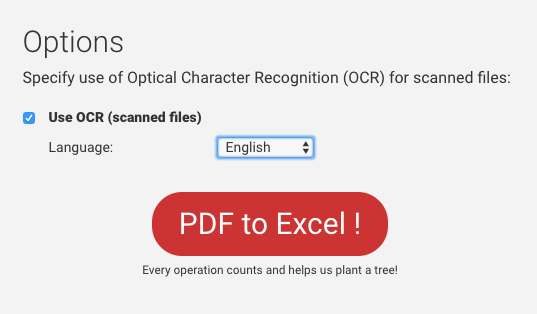 The PDF to Excel tool enables you to convert PDF files to Excel spreadsheets, with OCR support for scanned files. Click "Browse" to open a file picker and select files from your computer. You can select many files at once or repeat multiple times. Upload files from Google Drive or Dropbox by clicking on their respective icon in the upload area. You will need to authenticate with the corresponding cloud service and then select the files from the interface that pops up. You can select many files at once, or repeat multiple times. 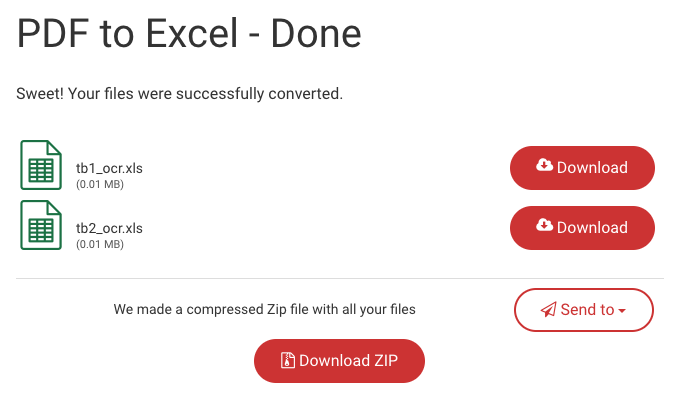 Click "PDF to Excel" to perform the conversion. You will then be redirected to the download page where you can download the Excel files once it has been processed. The file names refer to the original file name (origfile.XLS). Simply click on Download to download each file. Note that you need to be logged in with an account to be able to download files. If you do not have an account, you can sign up for one and download your file right away.